» Selling Public Space: Could Corporate Logos and Ads Be Coming to Our State Parks? 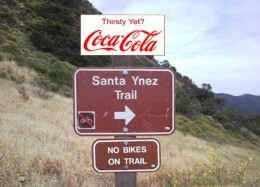 Selling Public Space: Could Corporate Logos and Ads Be Coming to Our State Parks? Here in Los Angeles, we have city buses plastered with ads, and bus shelters and “public amenity” kiosks hawking everything from fast food to liquor to the latest violent video games masquerading as feature-length films. Floral ads have been planted on our freeway rights-of-way, and some state officials want to sell commercial ads on freeway message boards. With the California state park system hard hit by the budget woes in Sacramento, and a captive audience of millions of hikers, picknickers, and other park users, it’s not hard to imagine those same officials thinking about willing advertisers as saviors. In Georgia, the state government has decided to do just that, seek out corporate sponsors in an effort to keep parks open and maintained. Below is a news report on the issue from NPR’s All Things Considered.